Scientists have always known that fruit fly larvae feast on rotting fruits and vegetable matter. But young maggots apparently also have a taste for their elder group members, according to a new study. Worst yet, when an older larva gets injured, group cannibalism ensues. It is as horrifying as it is fascinating. When the circumstances are right — or wrong, depending on how you look it — many non-carnivorous species will go cannibal. For example, some tadpoles are known to eat conspecific eggs, an act that not only provides nutrition, but also gets rid of future competition. And when food is scarce, swarming locusts and crickets will snack on each other, as they are the best source of salt and protein around; in fact, cannibalism avoidance partially drives their mass migratory behavior. 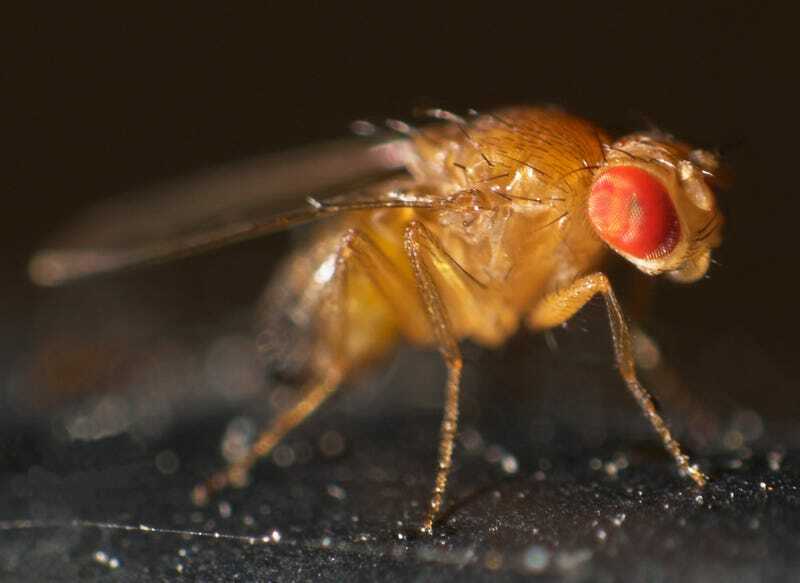 Though scientists across the globe have been studying fruit flies for decades, larval cannibalism has gone unreported — until now. "We found it by chance, and then we started digging through the literature and we couldn't find anything about it," said Tadeusz Kawecki, a biologist at the University of Lausanne in Switzerland and co-author of the new study. "We found that fact more surprising than the behavior itself." After hatching, fruit fly larvae will go through several pre-pupal life stages, called instars. During their first couple of instars, the maggots will eat as much as possible. During the third instar, they will become sluggish, stop eating and seek out a comfortable spot to pupate (and become six-legged, winged, annoying adults). In their lab, Kawecki and his colleagues found that young larvae in their first, second or early third instar will regularly leave the food medium and crawl on the wall of the culture bottle, where they actively hunt "wandering-stage" third-instar larva. An individual will attack an older maggot by repeatedly rasping with its mouth hook until it can break the protective cuticle, at which point it burrows into the larva's body. Not long after, other young larvae will join in and have a cannibalistic feast. It's hard work breaking through a protective cuticle. Courtesy of Vijendravarma et al/Nature Communications. Seeing this odd behavior, the researchers decided to take a closer look and find out just what the hell is going on. First off, the young larvae aren't eating their elders out of some kind of gerontophobia, or because they're that delicious. "If we injured some young larvae, they attracted potential cannibals, too," Kawecki told io9. The cannibals are seeking out the elders because they are the most vulnerable — they are preparing to pupate and can't readily squiggle away. In other experiments, the team placed one needle-pricked wandering larvae and one immobilized wandering larvae into a dish with well-fed young maggots. Most of the youngins' eventually moved to go eat the hurt elder, suggesting that injured larvae release chemical cues that draw cannibals to them. Moreover, it shows that even healthy larvae will go cannibal if that's what's available. And when the young larvae were protein starved, they were quicker to eat their elders, suggesting that malnutrition also plays a role in the cannibalism. Group cannibalism at its finest. Courtesy of Vijendravarma et al/Nature Communications. Adding to these results, the team found that the cannibalistic behavior evolves specifically under nutritional stress. They raised six populations on poor-quality food for 118 generations and six others on standard food. After this, when no other food was available, the malnourished larvae cannibalized uninjured wandering maggots almost twice as much as the healthy larvae did. Not only that, they were also more efficient hunters of the uninjured wandering larvae and were better at locating injured victims. The researchers saw that larvae could also become more efficient killers if they were raised from birth as cannibals. That is, they developed about 20 percent more teeth on their mouth hooks than larvae who were raised on normal food. Kawecki notes that the results aren't conclusive, because the team wasn't able to show that having more teeth makes it easier to cut the larval cuticle. "The teeth are so tiny that we cannot check their mechanical properties," he says. However, cannibalistic tadpoles show similar changes, so it's quite possible that the additional teeth are by design. Finally, it turns out that larvae can actually survive on nothing but other larvae. They take longer to develop and end up being smaller, but they become adults and reproduce, nonetheless. Eating from the inside out. Courtesy of Vijendravarma et al/Nature Communications. It's important to note that this kind of cannibalism may not happen in nature much, if at all. The lab larvae live in incredibly crowded situations, which you probably won't see in your typical rotting fruit. Whatever the case, Kawecki thinks there's an optimistic message in all of this. "You can still discover something apparently new and exciting even if you are working with a species that has been worked on by hundreds of labs," he says. Kawecki and his team detailed their findings in the journal Nature Communications. Top image via Mr.checker/Wikimedia Commons.